In his Statement for the Record on Worldwide Threat Assessment, Director of National Intelligence James Clapper discussed the situation in Syria and Iran’s involvement in that country’s civil war. We have posted his comments onIran’s nuclear and missile program, and below are the text of his remarks on Iran and Hezbollah in Syria. “In Syria, the ongoing civil war will probably heightened regional and sectarian tensions. 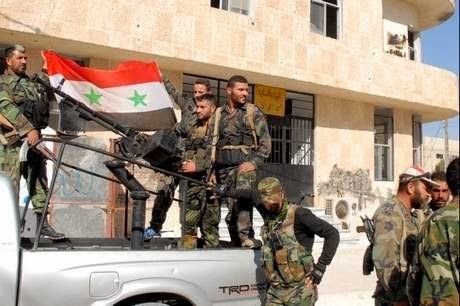 Syria has become a proxy battle between Iran and Lebanese Hizballah on one side and Sunni Arab states on the other. Fear of spillover has exacerbated sectarian tensions in Iraq and Lebanon and will add to the unrest. The influx of over two million Syrian refugees into neighboring countries will continue to impose hardship, particularly on Jordan and Lebanon. Iran and Hizballah are committed to defending the Assad regime and have provided support toward this end, including sending billions of dollars in military and economic aid, training pro-regime and Iraqi Shia militias, and deploying their own personnel into the country. Iran and Hizbollah view the Assad regime as a key partner in the “axis of resistance” against Israel and are prepared to take major risks to preserve the regime as well as their critical transshipment routes. Interesting that Russia wasn't identified as the more powerful and useful diplomatic partner for Syria, as well as a key provider of arms. For Hezbollah, it is surprising to see their current military activity compared to levels during the campaign that successfully liberated southern Lebanon from foreign military occupation. I'm guessing Clapper is characterizing its taking the field alongside its allies in the defense of Syria as "terrorism." In the assessment is there any linkage drawn for Syria and Iraq confronting the same Al-Qaeda threat? That' threat represents the greatest frequency of terrorism in the region, and its considerable financial support comes from Gulf sources within countries allied with the United States. Just today, the Ministry of Transportation in Iraq was hit by suicide bombers with dozens of dead and wounded. Yes, the assessment does include a rather long discussion of the Al Qaeda-affiliated terrorist groups in Syria and Iraq, as well as other global threats. In the two posts, I just posted the text on Iran. Good news. All basiji and IRGC terrorist units should be sent there for martyrdom operations.Less of these scumbags to worry about in the future.